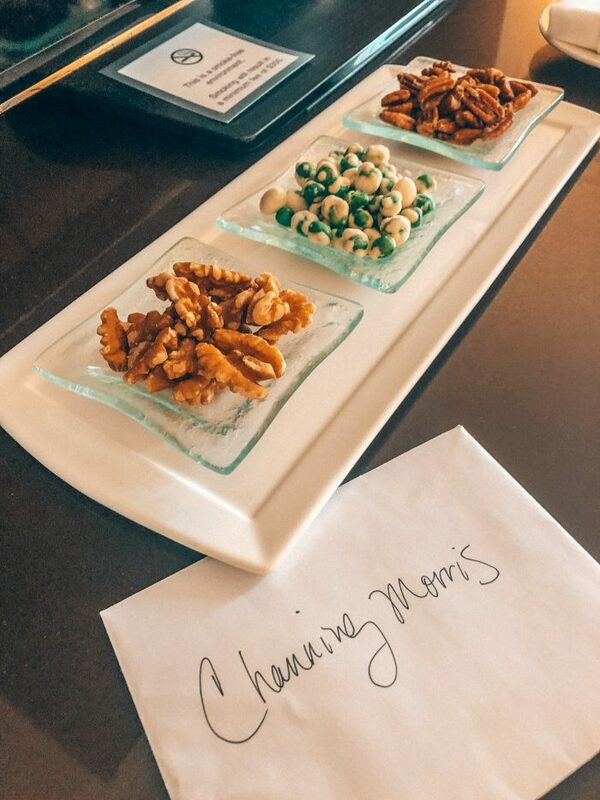 We stayed on the executive floor, which gave us access to a great lounge filled with snacks for happy hour. Y’all know I have a pretty high snack standard and The Royal Sonesta exceeded my expectations. 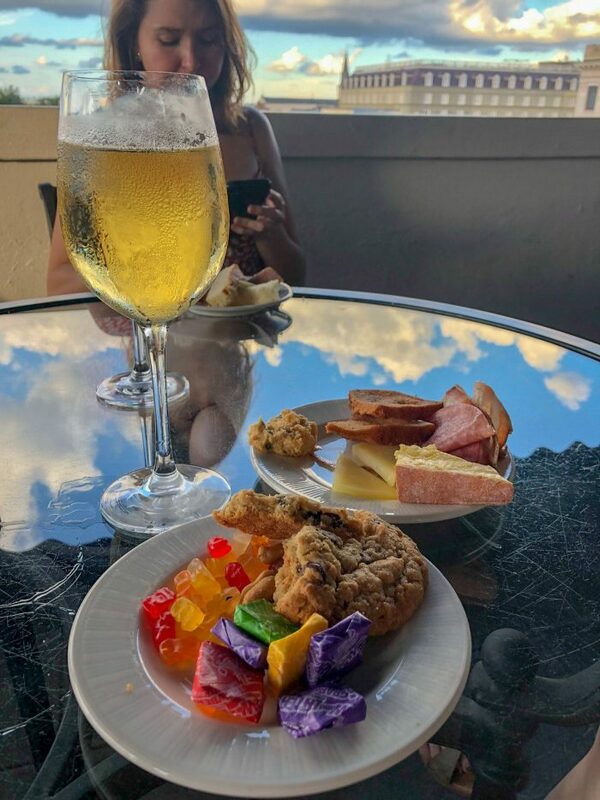 Kristina and I piled our plates high, grabbed a glass of wine and enjoyed it out on the little balcony overlooking the French Quarter. We chatted with other guests about our day and exchanged restaurant recommendations. I do believe they also serve breakfast here but we had brunch plans every day. 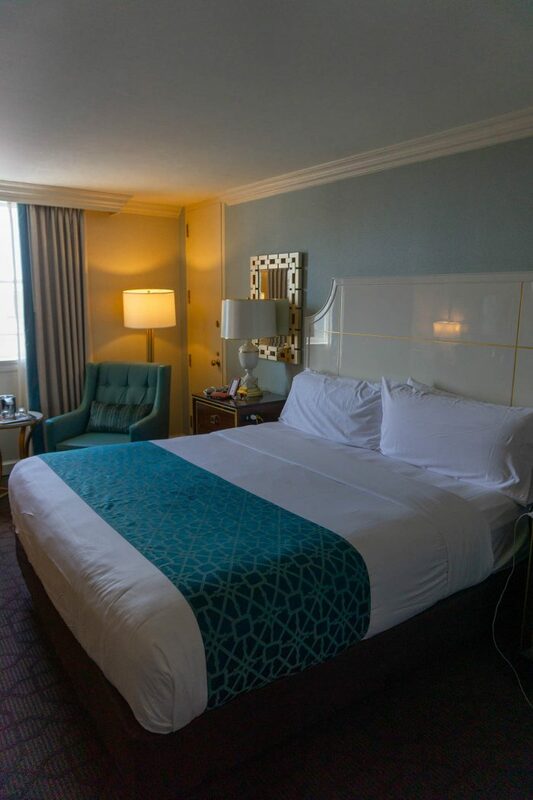 Our room was perfectly comfortable with everything we needed. I know I’m alone in this sentiment but I prefer a full shower rather than a tub shower so I really liked our bathroom. 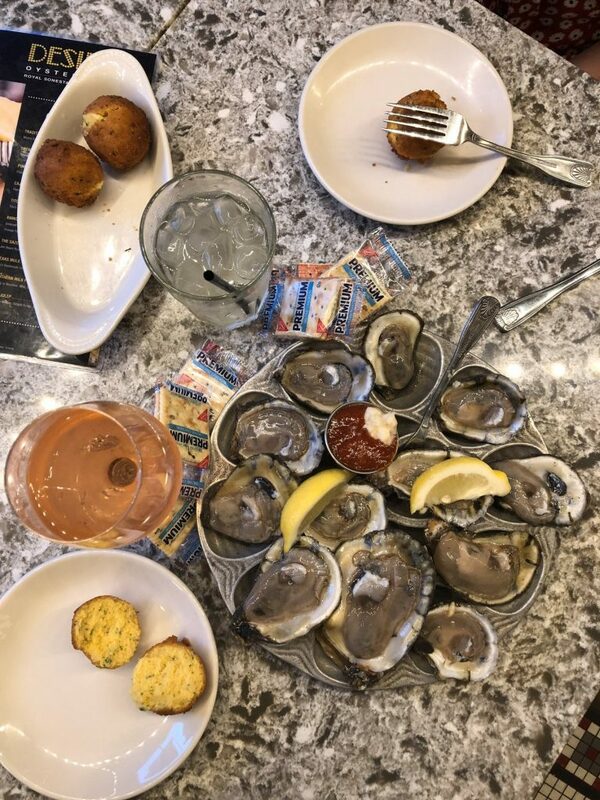 The Royal Sonesta has a number of restaurants on site including Desire Oyster Bar, which we stopped in for an oyster and hush puppy snack. To be honest the hush puppies were really the stars of the meal. We spent most of Friday eating and drinking our way through the city, but Saturday we made a pool day. New Orleans can be very hot and very humid, even in September. 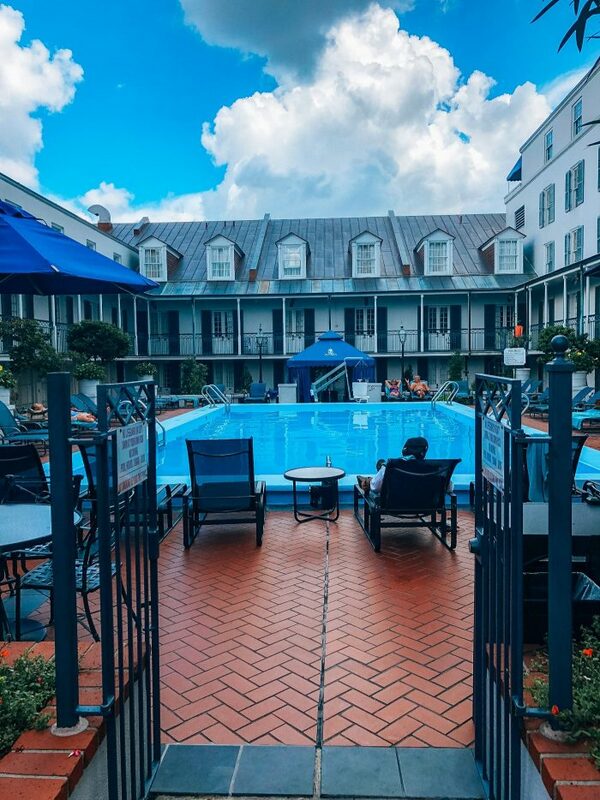 Hell, probably all the way to November… so the hotel pool was key to us. 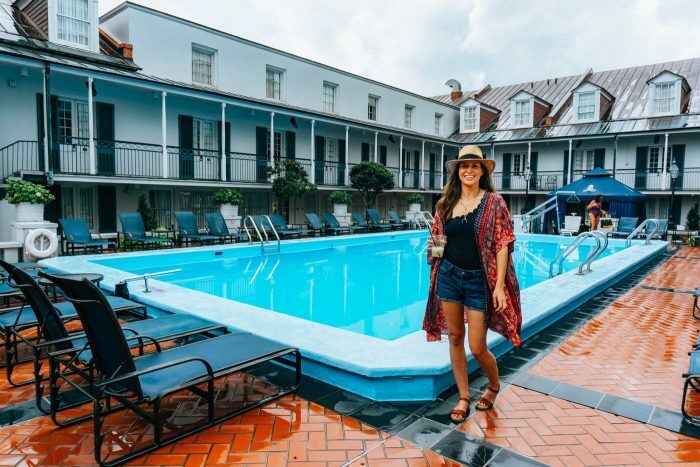 The Royal Sonesta has a killer pool in the middle of the courtyard giving it a very New Orleans feel. 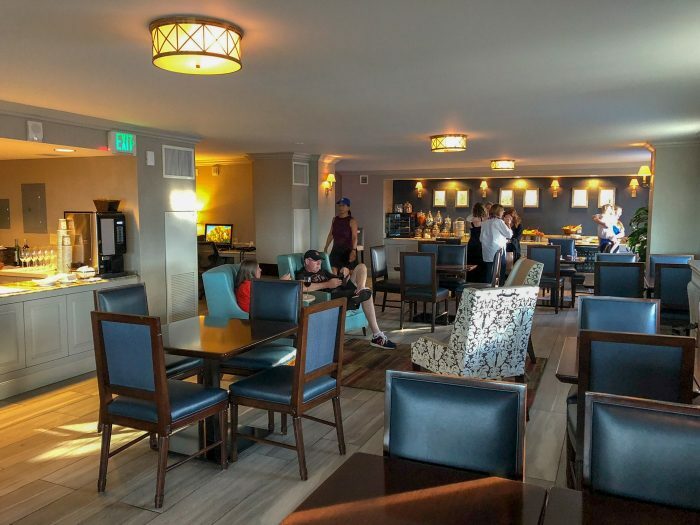 The full bar also offers made-to-order drinks and a small food menu – burgers and such. We drank vodka lemonades and enjoyed our last little bit of summer. Honestly, the entire time I was just thinking how I wish we had a pool in Denver. 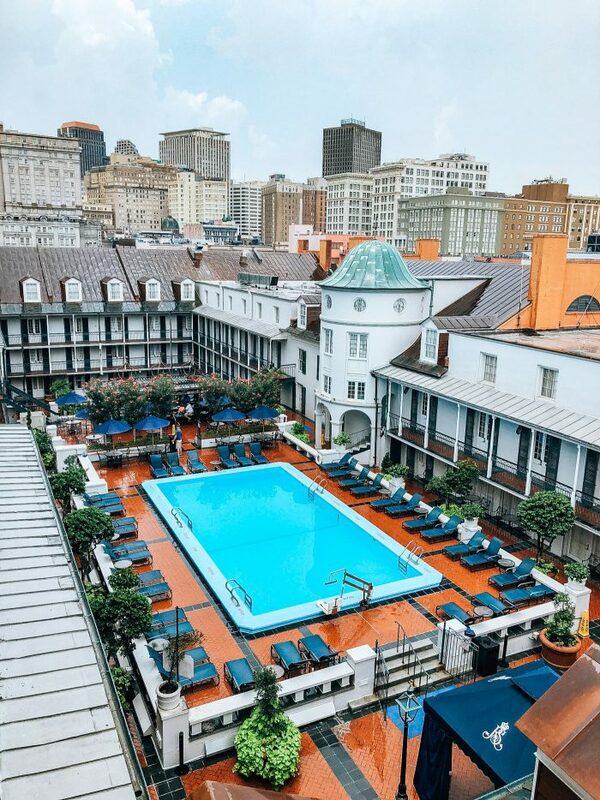 And that if flights were cheap, Clay and I should just scoot on down to New Orleans this winter for a little pool time. 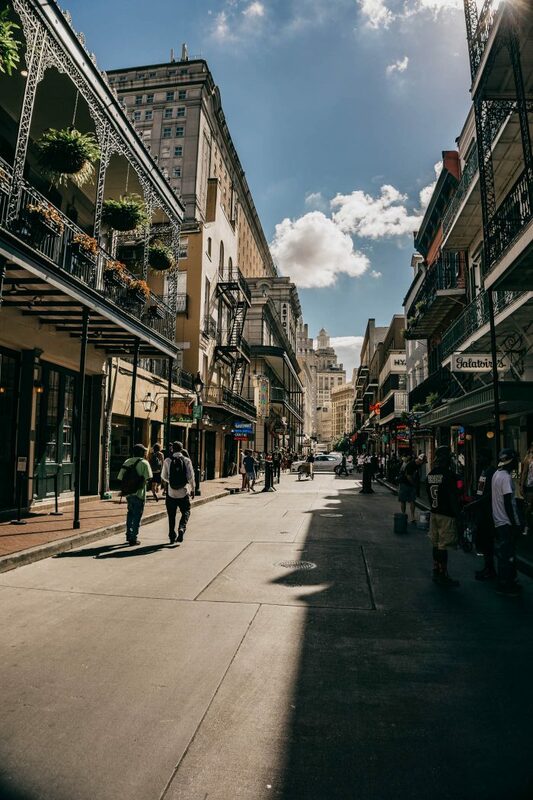 New Orleans is a tropical paradise that just isn’t the beach. But greenery is so lush and tropical and with the humidity, it feels like you’re very much at the beach. 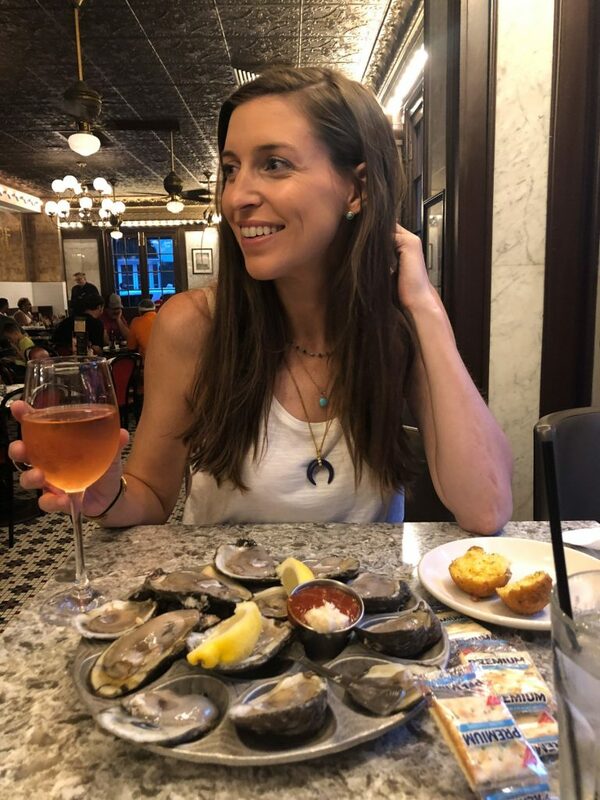 New Orleans is kind of the ideal city vacation, fabulous, delicious food, a nightlife that never stops, live music around every corner and an amazing soulful culture that can be found anywhere. 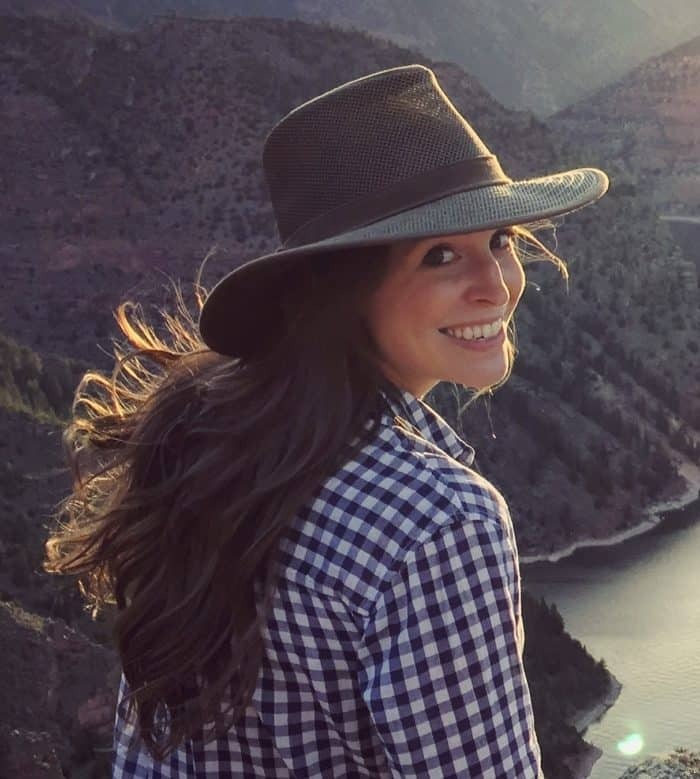 Plus the tropical vibes – honestly I think I could live there! 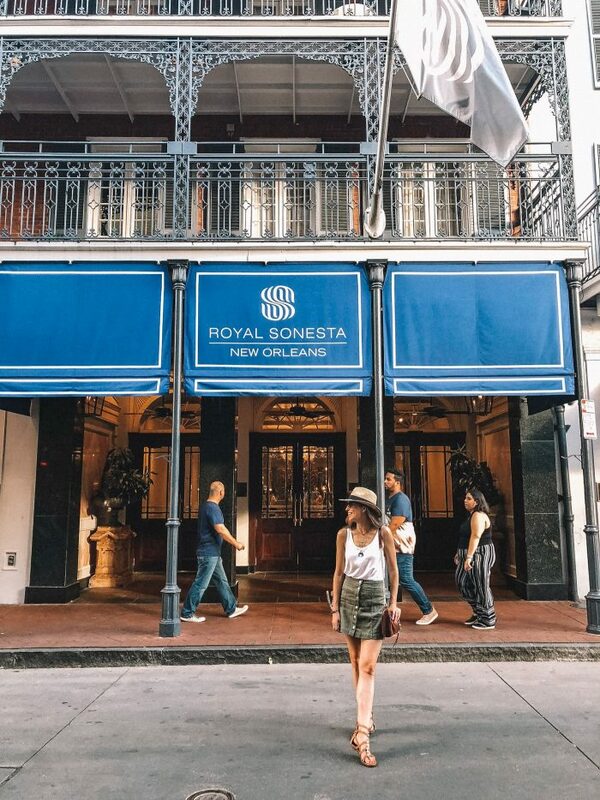 If you are thinking about heading to New Orleans again or making your first trip, I highly recommend the Royal Sonesta. 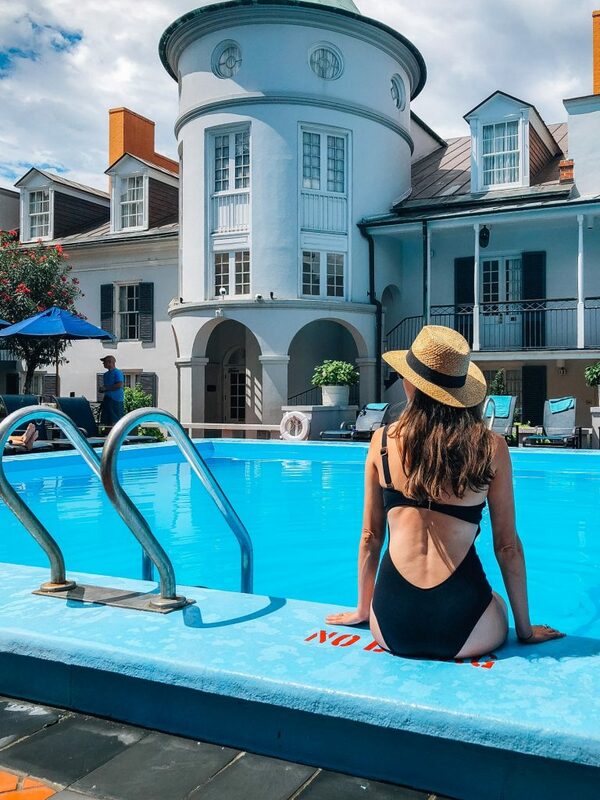 It’s the perfect jumping off point for your adventures and a little sanctuary in the city, an escape from the heat and sometimes crowded tourist areas to your own little oasis. 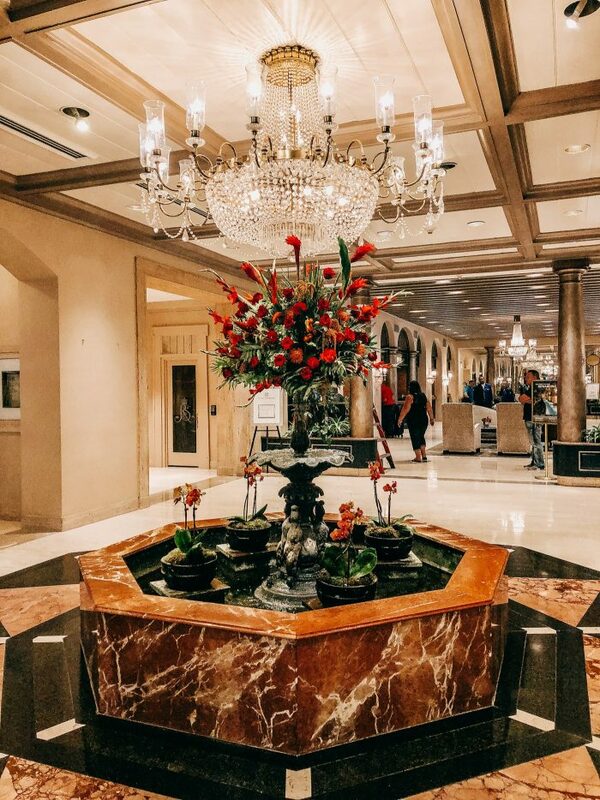 This post is sponsored by The Royal Sonesta New Orleans, as always, all thoughts and opinions are my own.